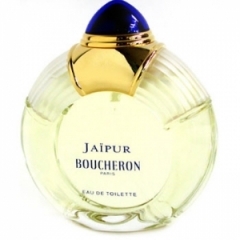 Jaïpur (Eau de Toilette) is a popular perfume by Boucheron for women and was released in 1994. The scent is floral-fruity. It was last marketed by PCI (Parfums et Cosmétiques International). Boucheron is a house that I greatly respect and admire. Their fragrances are always classy and elegant and their bottles, while unique and a little strange, are very attractive. I was eager to try Jaipur, however because fruity florals aren't my thing, it took me a while to become accustomed to the way it smelt. Peach and pineapple, when presented in a syrupy and rich fashion in fragrances, quite often turn my stomach. This fragrance is what I'd call a potent fruity floral. It's strong enough to be worn in Winter, while walking through the snow and icy, cold winds. The top notes were a little too much for me. It smelt like an array of mushed fruits with a heady aroma of liquer. The sweetness was a little overwhelming too. Towards the heart, the loud fruitiness diminishes slightly, making way for soft, slightly powdered florals. I began to like Jaipur a little more with its candied fruits and feminine floral accords. I could sense the elegance, which was similar to the beautiful, distinctive Boucheron pour Femme. All their fragrances tend to have a very 'golden' and expensive feel. Jaipur is quite lush and intense. There are some beautiful moments when the rose, peony and carnation immerge. I find some similarities between Jaipur and Fragonard's Billet Doux, but only towards the drydown. The base notes are deliciously rich and soothingly sweet with vanilla, benzoin and amber creating a somewhat exotic end to a strange yet captivating fragrance. The longevity and sillage are very strong, so I recommend applying with a light hand. I think it could wear well in almost any season, but I will stress that this is not a fragrance for little girls. It's very classy, mature and lady-like. Write the first Review for Jaïpur (Eau de Toilette)!